(Update: Heard Brendon O'Connell and others, early on explain, why and the video's authentic. 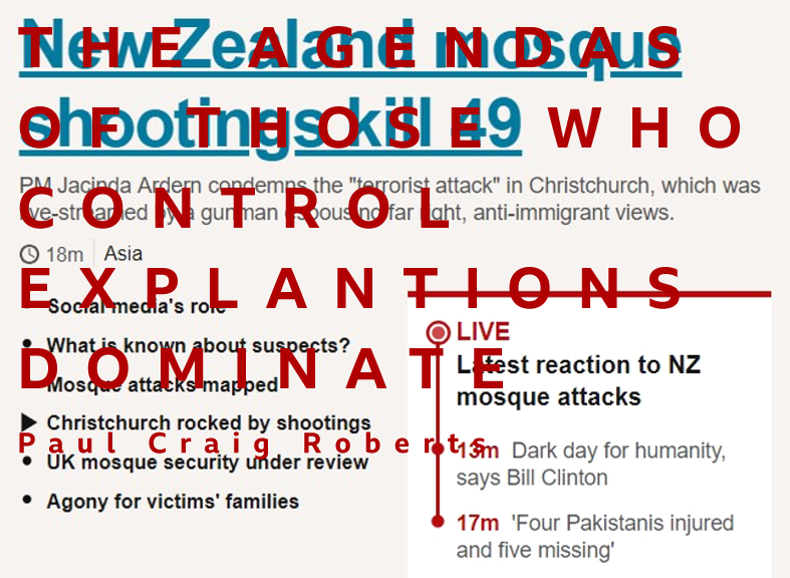 Heard the Sybil interview, Max Igan references and sterling speak with The Christchurch Massacre - An Independent Analysis. Someone wrote to me; 'Best analysis of Christchurch I've heard, I think...'. The last word's where I'm at... Even with this from Max, remain open. Blessed to be wrong. In some things. On writing? Might be a dozen sites to read but the mod pop medium for the crowds. Video and YouTube. The wars of termination. Communications and ‘truths’ showing, and/or believed brings difficulty. Paul Craig Roberts expresses the challenging undertaking if you're having a go. The second line of The Difficulty of Writing for Americans gives us: One reason is that many, especially of the younger generations, no longer have a concept of objective truth. Highlighting the young is precise and important. It's more the young-uns in modern tradition who bunk into the army. Fight the power etc. More time to get concerned about should add motive. We’ve come to expect 'student' uprise and ideals. Instead, the word is the drugs work and the music is magic. A whole lot of make-the-most, in the face of imagining brick-wall to changing tomorrow. Empathy and hope are low. The prevailing culture and appetite in many, ...no longer have a concept of objective truth. Talking way too many in their 20’s and; For “truth” is simply a bias reflecting one’s race, gender, upbringing or predisposition. Emotion overwhelms fact. Feel is hopeful. Not 'here’s how'? Let alone ‘why’? Closed eyes shut. Straining in the dark and “…could be lucky and dark ages are, well, ages away”. Bach and buildings took a thousand years. How long are the 'ages' to come? Aren't on any-way to a natural selection, we've digital-wielding 'masters' who have us all in their city. Watching, and moving what-can where. Again and repeat; Falsies are full of flags showing their skulls and crossbones. Be like the originators and populist making ‘pirates’. Dressed up, flags rippling in the sea winds. There wasn't any/much. Presume the phones were all whisked up and returned with deletions. The Thomas Mair most probable travesty went awry. This planned falsy was for tighter cover. But Tommy picked an unexpected cap to wear and went on an unexpected track. Rogue MI5 had to dynamic risk assess and a neighbour caught them when they caught Tommy. The arrest and photos. A video even and cats out. Information controlled and miscommunicated. Aka., lying. Even revealed video of an operative fitting the description of fake Tommy. Could have been the murderer. Alleged… even this, in-question, although a remoter possibility fake and not straight-up, false flag. With Christchurch, the case for deaths is strong, with fakery intertwined. Bearing false witness. Actors/community participants. Either way, the footage is full-on, made to mock serious consideration and authentic. The contrast Jo Cox killers’ wanted confidentiality. Christchurch wanted the lying seen. So when the unwilling -- or circumstances dictate -- to repent, the failure produces its poison. Suffer ongoing shame. On to disregard and lost in cynicism. Death inside to truth. Richard Hall has produced what Panorama for the people would make-level and better, current affairs programmes. Box set. Substance rich and careful coverage. Be surprised if I see better TV-style reporting all year and: 'Exit From Brexit, The Jo Cox Departure'. Gripping and shocking. The next and seeing/acknowledging the lies and awake, argue online, over deaths/or? Entrenched in a proclamation. In the middle ground sites and Truthers get on the comments comes the ding-dong. To even talk 'another story'. Holders the standard line here prevail but now having to not admit, not-look or, be looking-away? All the time. watching what's said. See how the confuse circus works? Intentional with crude symbolism. Deep for some in the spell-ing it, they think. Red dress, shoes. On to clues for the next location and ‘Miami’ on a cap. ‘Anaconda Malt Liquor’ noting and going for his second successful Dammegård. Is it called Dammegårded or Dammegårding? (Re; Ole Dammegård). Pick the next location. Ole has picked and seen come up. 'That's me, that's me in the corner.... losing, my religion'. The one insisting we agree with the BBC and agenda-controllers. The religion of looking 'reasonable’ with unreasonable conclusions, taken out, for narrow parameters. Out and limited information, that suits and sound smart, regardless. If it does scream a question mark, gets a breezy smug-off and if necessary a glib childish brush over. What must never see the light of broadcasting day, is the enquiry, asking to make sense of non-sense. Explicit or implicit talk is in the 'careless talk and dangerous' category. The reaction in the answer. What was that old Evangelical paperback pop. hit called? ‘Evidence demands a verdict’. How about in our dominating with silence times. Evidence... is edited out. In NZ and soon coming, world-west wide. The evidence is a criminal offence. Video, images or words -- a controlled 'substance'. Remote searches and doubtless get online-sent fines and notifications. Licenses and barring in the digital realm. Even mention an intention to look. Go, "Have you seen..?" Again, with urgency interrupt or jump-on. Volume and concern up. Christchurch has hammered the self-expose home. Crazy enough to convince the ones who say it's too crazy to be a con. The rational and answer are that it would be effective in carefully done if it wasn't real. We'd never know. Like the movies. This shooter/camera-person is all jerky and the whole feel is care-less and hand-held. Not supposed, hand-editing to make look like and go out later as live. While actual killing goes on. Not to know without a whistle blown by participator or first-hand witness. Why not. Heard Kevin Barrett and Alan Sabrosky friendly lock horns but strident truth clash. I’m more with Kevin on no 'no-go areas'. My experience and those known or acquainted among and Muslims -- who identify as, and more or less active. My experience has been some and some but all in all ok. With the note that my literal neighbours next door and people get to know… and others. Some of the best and surest peep have known. Reliable, kind, and warm. Connecting with families. Top. Time and time again. As for no-go areas. Depends but not as conservative -- and don't name the flags-false -- truthers would have it. Or Alan Sabrosky on this, yet he goes to the core and so spot-on about Israel and the flags. Time up. Thanks for reading.